I reviewed the ill-fated Robert Pascal’s exclusive Le Premier eons ago, his revisionist Bistro Pascal that followed, and half a dozen other spots over the decades that failed to live up to great expectations. John Clancy’s East couldn’t overcome the curse despite his foodie credential. Peaches foundered too but then Marla Maples’s karma had already been revealed when Donald Trump filed for divorce minutes before his tight-fisted pre-nup was due to expire. Indeed, pit-smoked barbecue is a cosmic reversal from Levy’s two recent strikeouts: a kosher Japanese steakhouse named Haikara Grill, and, before that, Il Patrizio, a kosher Italian dairy restaurant. 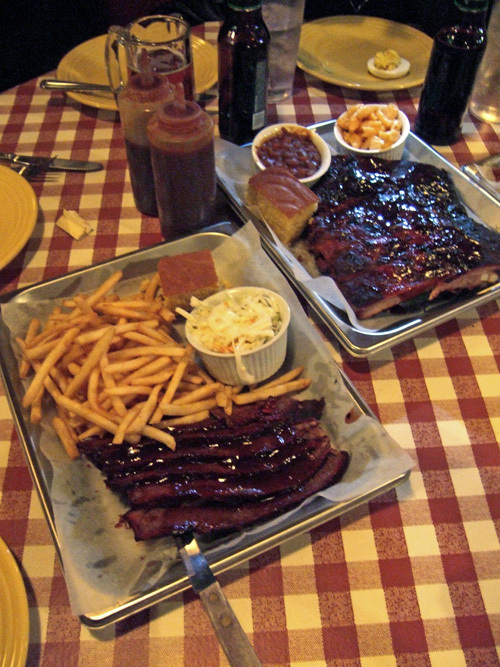 But our party, including three twentyish trenchermen, agrees with me that the St. Louis ribs are really good – meaty, savory, not too sweet – and so are the thin-cut fries. Checkered oilcloth-cloaked tables and stand-up ordering have a strange fast-food feel for this hoity street; Le Premier was so elegant it had an unlisted phone. The bar does help. A good stiff martini always soothes, and two can dull the edge of critical faculties. . Our visiting nephew from Chicago is high on the brisket, and we all agree that tiny sides of mac and cheese, coleslaw, and hickory-smoked beans are good enough, though Miss Grimble should be ashamed of that apple cake. Levy – I’m guessing from his defiant proprietary air – ambles by to tout the banana-cream pudding with its money-back guarantee. “If you don’t like it, give me the money and don’t come back.” Okay. More Borscht Belt than down-home. But the pudding just happens to be fabulous. As of that outing, there’d been no sign of good neighbor Talese.